Officials of the Nigerian Police Force have arrested a young man identified as Idrisu Muhammadu, for allegedly killing his girlfriend, Fatima Isah for having an affair with his elder brother. 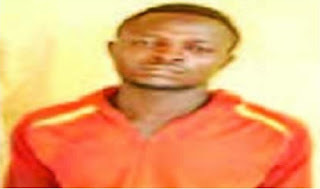 According to newsmen, Muhammadu allegedly killed his former lover at Evutagi village in the Katcha Local Government Area of Niger State, after her father, Isah Evutagi, decided to give his daughter’s hand in marriage to another man. It was gathered on Tuesday that Muhammadu had earlier threatened to kill his victim if she did not marry him. The father of the deceased reported the threat to the police about three years ago. While speaking to a correspondent, the suspect said that he and his elder brother had been contending for Fatimah’s love. He said, “I told my brother to leave Fatimah for me because I planned to marry her, but he would not listen to me and he kept on seeing her until one day, I lost my temper and killed her.